Sewing with Knits is essential for everyday clothing construction. For the past two years or so, the majority of my sewing projects have involved knits. 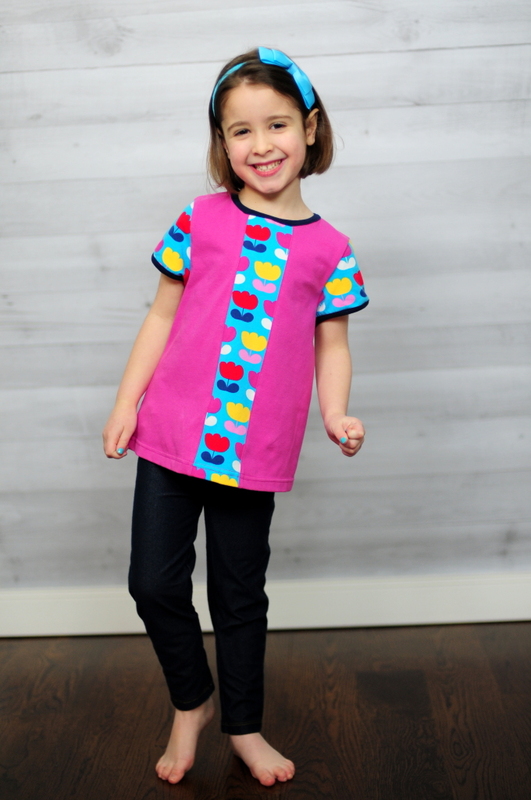 This is mostly due to the fact that I do most of my sewing for my kids, who prefer knits for their everyday clothes. And why not? Knits are soft, comfy, and can be stretchy and warm, too. What’s not to love? 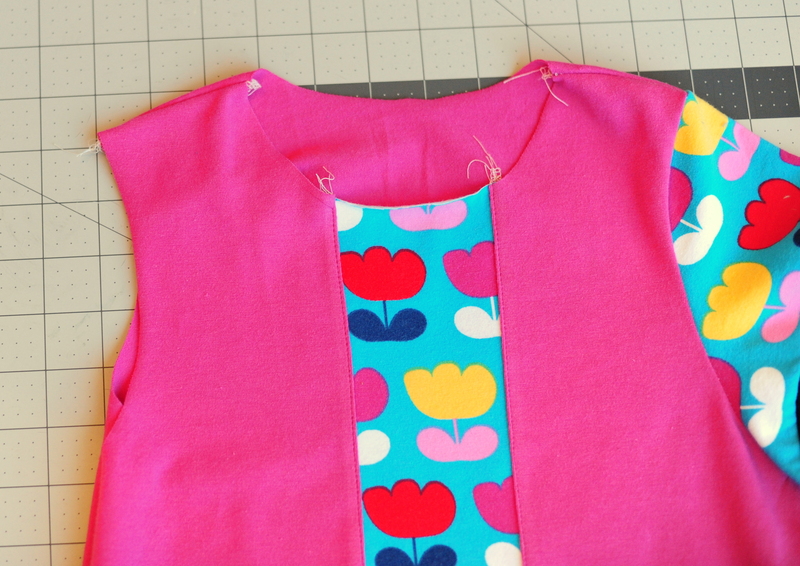 Here’s the tips and tricks to sewing with knits! Well, for one thing, knits can be a bit more unpredictable (and less stable) to sew with when compared to woven fabrics. (Actually, I’m pretty sure my mom – an experienced seamstress herself – rolled her eyes and told me, “you’re nuts!” when I said I wanted to start sewing with knits.) Just as not all wovens are created equal, the types of knits available to us vary widely also. With just a few tips and tricks, some inexpensive knit to practice on (I like practicing on clothes that are bound for the donation bin – there are plenty of unworn treasures in my own dresser), and a willingness to experiment a bit, I was quickly hooked on sewing with knits. 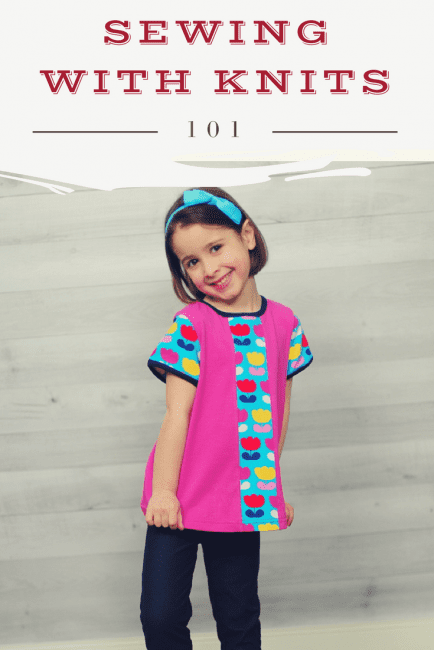 It took me a bit to start producing clothing that was hand-me-down worthy (that seems to be the true test in our family 😉 ) but with a lot of practice (and many, many neckbands, hems, and sleeves) I love what knits have to offer and how efficiently I can make clothing for my kids that looks like their favorite ready-to-wear styles. 2. Clover Wonder Clips. I haven’t used many pins lately, and my sewing has improved. These little clips help my fabric stay flat and force me to pause and slow down a bit since they can’t jump under the bus (er, presser foot) like a pin can do so I have to remove them as I go. My kids love to steal them from my office, so I have to hide them. You can use paper binder clips as well for a similar effect, I’ve heard. 3. Washaway Wonder Tape. It’s double sided, won’t gum up your needle, and like its name promises, will wash away when you’re done sewing and toss the garment in the washing machine. I start to get a little panicky when I think I’ve run out or have misplaced one of the several rolls I keep hanging around (it comes in a smaller roll than the one I linked here, but you’ll want as much as you can get. I promise.). 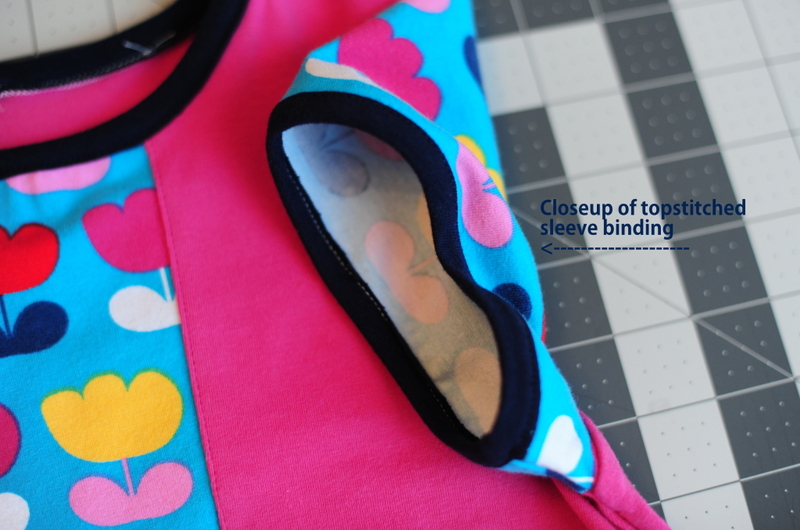 I use it to hold layers in place temporarily, keep a collar lining pressed down to the seam line when topstitching from the outside, hold my zipper in place for basting, press a finicky hem, and many other things that I’m sure I’m forgetting. I <3 wonder tape. 4. Choose your fabric wisely. If it’s your first foray into sewing with knits, don’t run straight to the cutting counter with the drapey blend with skinny stripes – you’ll make yourself crazy! Start with something more stable, like an interlock. Interlock doesn’t have as much stretch as some other knits (like cotton/lycra or jersey) so it is more stable to sew with. This means the edges won’t curl up on you as soon as you cut your pattern pieces, they won’t try to wrap around your pins or clips, and it will be easier to focus on your sewing when you’re not as consumed by coaxing the fabric to stay flat and behave. Along the same lines, even a stretchier or slinkier knit can be manageable for a knit beginner – aim for at least a medium weight fabric if possible (a lot of online shops will list the weight of the fabric, and I like to try to use knits that are at least 8-9 oz a yard in general. And even a little heavier/thicker if I’m making something like leggings or a fitted top/dress. 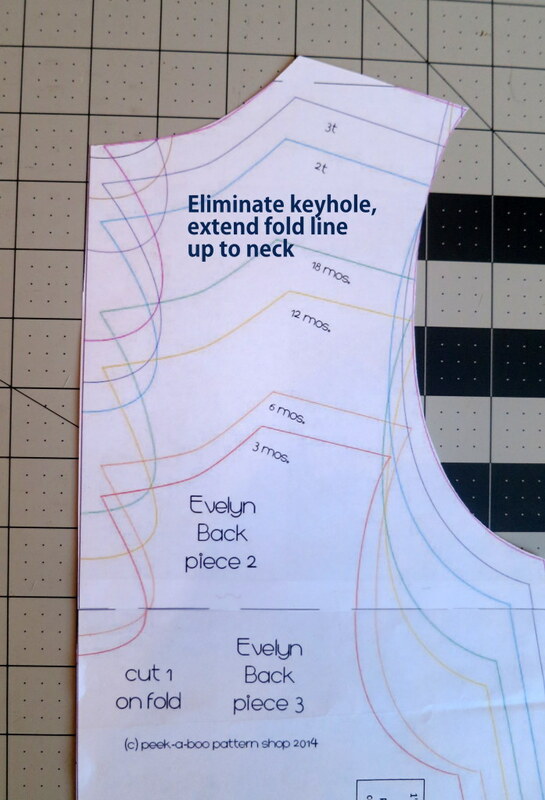 I cut the pattern pieces as instructed, with only one minor change – I eliminated the keyhole opening in the back. 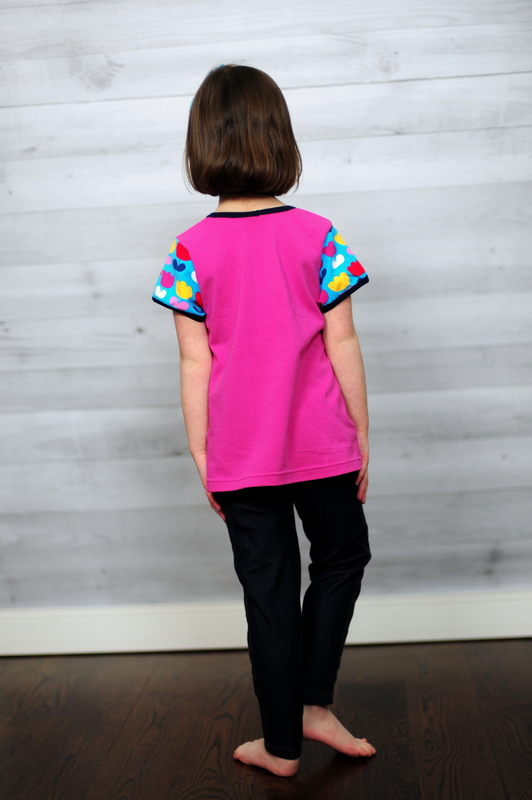 (For reference, I sewed a size 4 tunic for my 5 year old. I added a little length to the hem to account for her height, though.) 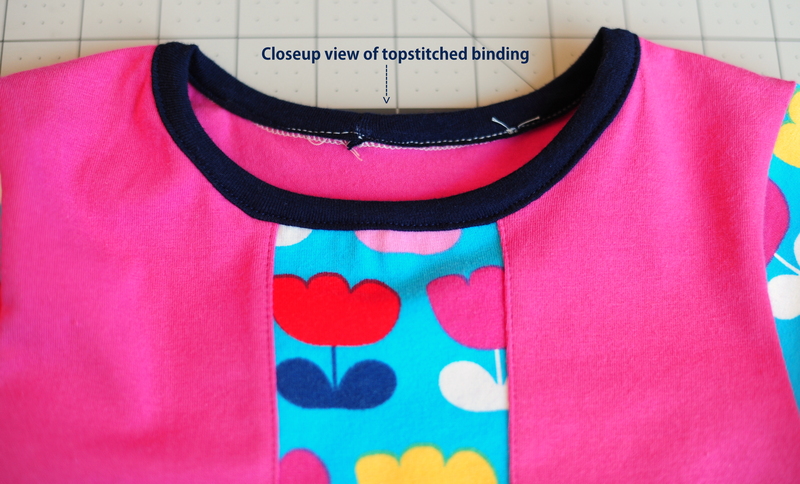 Below is a closeup of how I extended the line at the center back (which is cut on the fold) to the neckline, rather than cutting out the keyhole from the woven version. 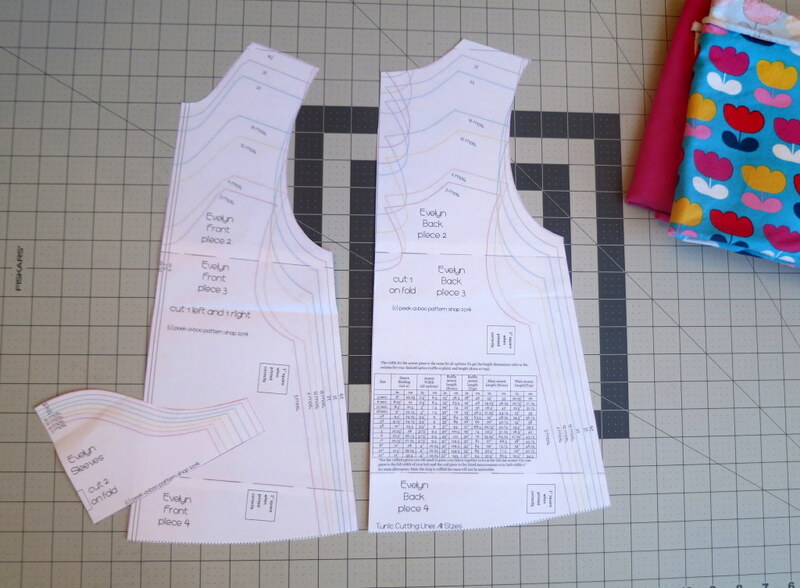 In the next photo you can see all of my pieces cut and prepped for sewing. 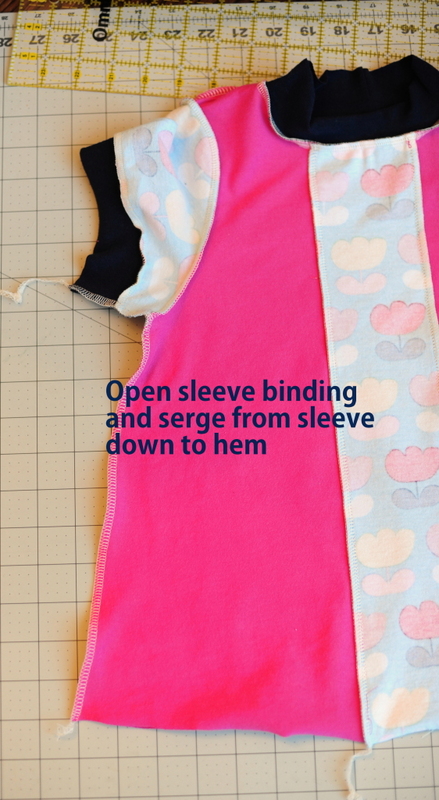 I assembled the bodice and sleeves using my serger, and topstitched the binding and the center panel with my sewing machine. For topstitching, I used a ballpoint needle and a lengthened straight stitch. 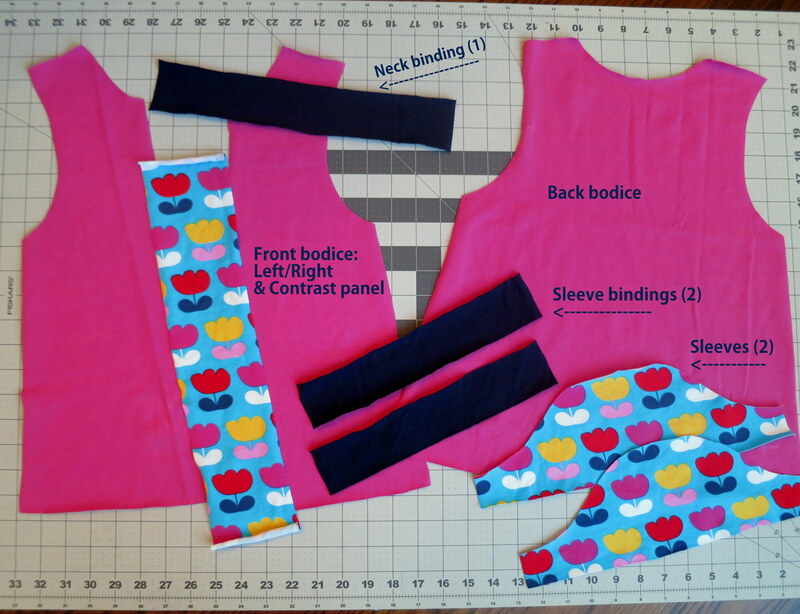 I followed the pattern instructions to sew the sleeves to the bodice, and then serged on the strips that I had cut for my bindings. 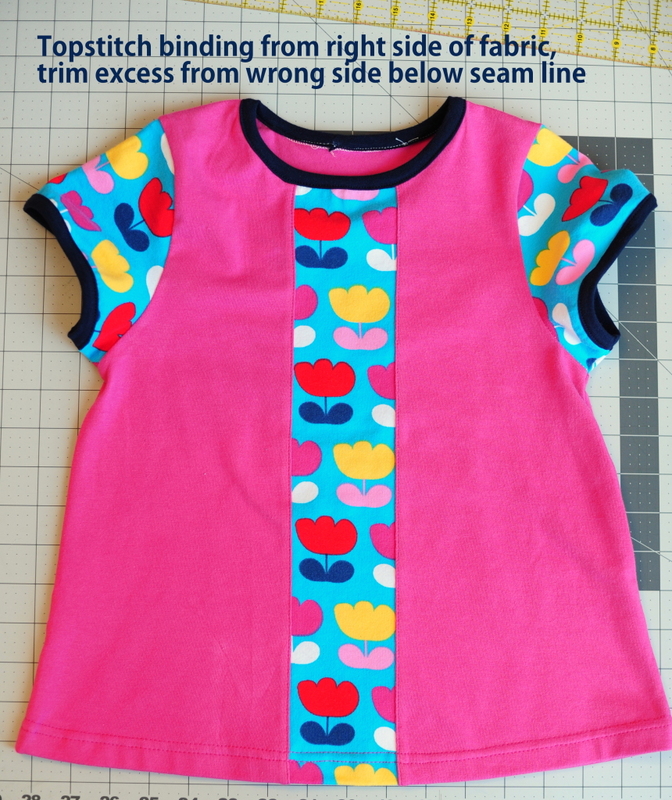 I cut them to the lengths specified in the pattern this time. 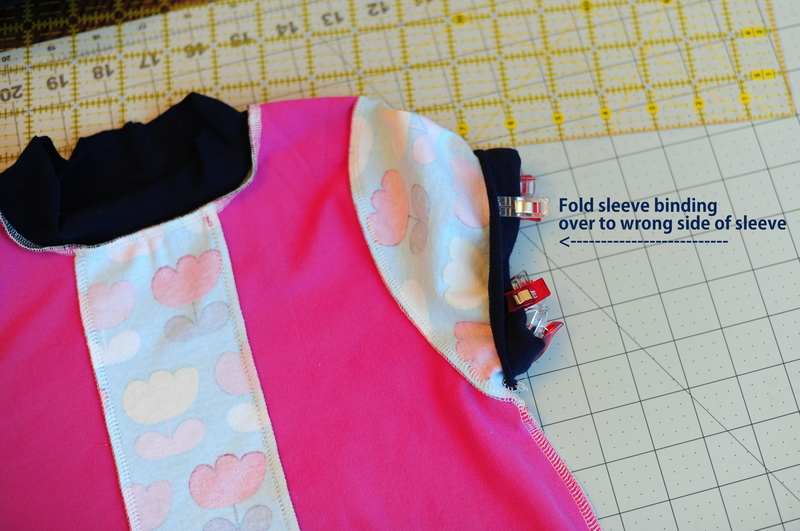 In the future, I might shorten the arm bindings a little bit (and just check her arm circumference to make sure I don’t shorten them too much) and gather the sleeve edge before attaching the binding to make the sleeve puff a little more (as it does in the woven version). 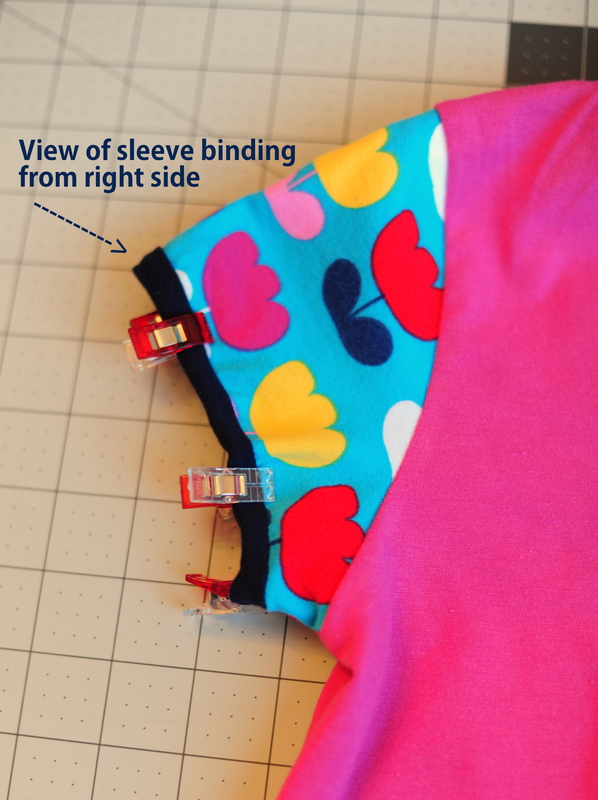 In Amy’s tutorial about bindings, she shows the proper way to do them when sewing with knits, folding the inside edge back up to the seam line so there are no raw edges exposed. The way I did them here was just a little quicker (and a little less neat), since I didn’t refold the binding under and just trimmed off the excess instead. Here’s the finished product – I love how it turned out, and it fit Miss P quite well. She loved how comfy it was (I used cotton lycra fabric for the main fabric, accent panel, and bindings), and I love how sweet and springy it looks. Spring is still a ways off here, but I can dream, right? 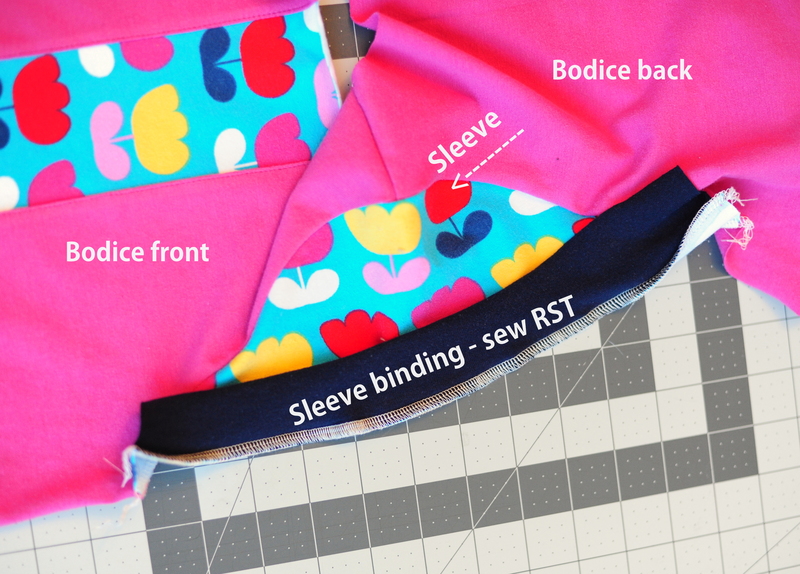 🙂 The Evelyn pattern is a great way to use a small piece of fancy/custom/precious/leftover fabric for the accent panel, and would be cute just colorblocked with different solids as well. I’ll definitely be making more of these – I love the versatility of a pattern that I can use with both wovens and knits. Have fun, and remember, don’t fear sewing with knits!